SANTA FE, N.M., Oct. 3, 2018 /PRNewswire/ — The U.S. 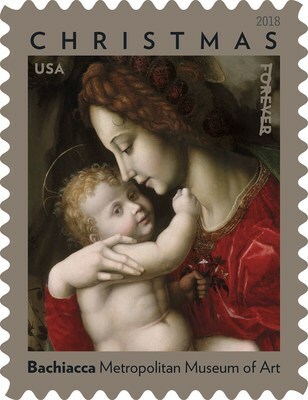 Postal Service is offering its customers a timeless Christmas image this holiday season with today’s dedication of the Madonna and Child by Bachiacca holiday stamp. The ceremony took place inside the historic Loretto Chapel. Five centuries ago, Francesco d’Ubertino Verdi (1494–1557), the Italian Renaissance painter known as Bachiacca, was a versatile and popular Florentine artist. Today his oil-and-gold-on-panel painting Madonna and Child still evokes the timeless traditions of Christmas. Around 1540, Bachiacca became a court painter to the duke of Florence, Cosimo de‘ Medici, who had made the Palazzo Vecchio his residence and required an artist for a wide range of interior decoration. For nearly the rest of his life, Bachiacca created ceiling decorations for the duke and duchess, as well as mural and easel paintings, tapestries, costumes and masks. Information on ordering first-day-of-issue postmarks and covers is at usps.com/shop under “Collectors.” A video of the ceremony will be available on the Postal Service’s Facebook page.